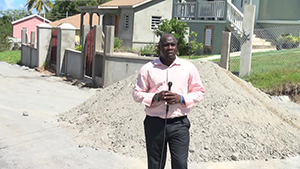 NIA CHARLESTOWN NEVIS (October 24, 2014) — Residents of Colquhoun Development in Cotton Ground, will soon have relief when a road under construction there is completed in a few weeks. Minister of Communication and Works Hon. 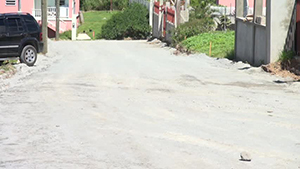 Alexis Jeffers said the new road was in response to repeated complaints from residents there. The Minister visited the area on October 21, 2014, for a first-hand look of the ongoing road works there and spoke to the Department of Information about the project. “It was important for us to come here at Cotton Ground. We wanted to see what was happening specifically here at the Colquhoun Housing Development. We have had numerous complaints from residents about the non-existence of the road here. It was a major challenge for the residents when it rains and even with dust when it is very dry. “So we decided to undertake this project, in terms, of brining some relief to the residents in this housing development and it is costing us somewhere between EC$230,000 to $250, 000 to put this infrastructure in place,” he said. At the end of the tour, the Minister described the work already done as substantial. He also explained what should be expected as the project moved along. “Some significant work has been done here. We have trucked in all of the base material, there is some drainage to be put in place and the levelling of this road would continue over the next couple of days. “Over the next couple of weeks, we should be able to cap this road and produce for the people of Colquhoun Development a satisfactory road,” he said. The Minister used the opportunity to thank the staff of the Public Works Department who had been involved in the project. “I want to thank the entire Public Works staff for their effort in making this road a reality. It is not cheap but we had to do it because of course that is one of the requirements of the Nevis Housing and Land Development Corporation and that is to provide the infrastructure for the persons who reside here,” he said. Meantime, Mr. Jeffers told the residents of Colquhoun Development that the Corporation had kept its promise of providing the infrastructure. “I want to say to them that we have stuck to our commitment of providing this road in a short period of time because the complaints were coming but we had to do what was necessary to bring it to fruition. This is one of those projects we have undertaken in recent times,” he said. The Minister disclosed that there were a number of other road projects that would be undertaken. “We are hoping to complete some roads in Garners Estate. There are some small pieces of road to be done in the Newcastle area and we have done some work in the Prospect area. I believe we have been trying our best, considering the limited resources we have to get some of these infrastructural work done. “Over the next couple of weeks, we should be able to come back and see a finished product here. The persons who reside here at Colquhoun Development will be pleased with what we would have produced for them,” he said. Mr. Jeffers also spoke about a second phase at Colquhoun Development. “There is a second phase as well, if I might say that, to the Colquhoun Development site here. This is the first phase, we have some land to the back of us here which we are going to be offering shortly for persons who are interested in building a house in this area and making this area their home. “So that would be something persons can inquire about over the next couple of weeks or they can do so now as a matter of fact, since this requires some planning in terms of them going to the bank and procuring their loans and so forth,” he said. The Minister further stated that he was pleased with the Housing and Land Development Corporation and its accomplishments when he considered the limited resources they had to work with. “We are making use of the limited resources we have and using it as wisely as we possibly can,” he said.